Battery to battery lead, battery negative to battery positive lead, 150mm length,40mm² sheathed cable 61/0.90mm. Battery to battery lead, battery negative to battery positive lead, 225mm length, 40mm² sheathed cable 61/0.90mm. 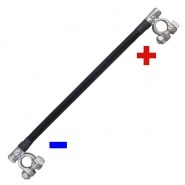 Battery to battery lead, battery negative to battery positive lead, 300mm length, 40mm² sheathed cable 61/0.90mm. Car battery leads from Arc Components Ltd. Negative to positive battery-to-battery leads, batteries terminal connectors for creating battery banks in series or parallel, to increase battery voltage output (series) or increase amperage output (parallel). Battery to battery lead, battery negative to battery positive lead, 150mm length, 25mm² sheathed cable 37/0.90mm. Battery to battery lead, battery negative to battery positive lead, 225mm length, 25mm², sheathed cable 37/0.90mm. Battery to battery lead, battery negative to battery positive lead, 300mm length, 25mm² sheathed cable 37/0.90mm. Battery to battery lead, battery negative to battery positive lead, 150mm length, 60mm² sheathed cable 61/1.13mm. Battery to battery lead, battery negative to battery positive lead, 225mm length, 60mm² sheathed cable 61/1.13mm. Battery to battery lead, battery negative to battery positive lead, 300mm length, 60mm² sheathed cable 61/1.13mm.